Pleitbezorgers van vrede uit de hele wereld hebben op 12 December 2007 deelgenomen aan het Global Peace Festival in het Rizal Park, Manila, georganiseerd door de UPF in samenwerking met Service for Peace, the Manila Bulletin, and the Manila Hotel. Meer dan 200.000 studenten, leraren, wetenschappers en bestuurlijke en maatschappelijke leiders hebben meegedaan aan de diverse activiteiten van het festival. Ook president Gloria M. Arroyo gaf acte de présence en de voorzitter van het Huis van Afgevaardigden Jose de Venecia Jr. (foto) gaf een inspirerende toespraak tijdens het hoofd event. The Global Peace Festival just concluded in Manila with a final celebration breakfast with Dr. Hyun Jin Moon. The Festival in the Philippines had very broad sponsorship and support from NGOs, key Filipino elected officials, religious leaders and their organizations and government agencies. A series of conferences were held concurrently throughout the week including the International Leadership Conference, the International Professors and Educators Conferences, the 2nd Youth Power Assembly and the International Youth Leadership Conference. The preparation for the event was done through service and education and partnerships with many mainstream Filipino leaders for the last year or more. The events culminated with the main day of the Global Peace Festival in which top performers and sports figures as well as most of the high schools and their marching bands and cheerleaders joined in for a parade, celebration, entertainment and words of peace for a great finale. 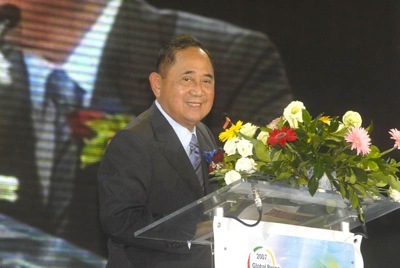 The event site was visited by the President of the Philippines, the Honorable Gloria Macapagal - Arroyo and a special address was given by Mr. Martin Luther King Jr in which he called on spiritual leaders to be thermostats and not thermometers so they take the lead and "set" the temperature for peace. Speaker of the Philippine House of Representatives Jose DeVenecia gave a most powerful address that was carried on the editorial page of the Manila Bulletin - Manila's most popular daily newspaper. The event culminated with the "One Family Under God" address by Dr. Hyun Jin Moon, which was received with great enthusiasm. The main paper ran over-the-fold headlines in the days leading up to the event and gave fine coverage the day after. The nation was touched en masse and at the highest levels. The Global Peace Festival has begun a global series of peace movement activities to lift up the role of the family, the importance of interfaith dialogue, service and youth leadership, and the strengthening of moral character-based leadership to achieve a culture of peace and reconciliation of all nations, faiths and races based on true love and the heart of "Living for the Sake of Others". A huge gathering occurred throughout the day. The Philippine military and all schools were in support. Religious leaders from the United States and dignitaries from throughout the Pacific Rim region attended. It was a tremendous beginning for this global movement for peace, which in 2008 will conduct festivals on every continent. It was an honor to attend with the Rev. Kwak, Dr. Walsh and the Regional Presidents of UPF. It is the model that will guide our way. Congratulations to Dr. and Mrs. Kim and Rev. Michael Zablan and all the Philippino citizens that made this festival into a success. Thanks and congratulations also to “Service for Peace”, the UPF and the YFWP ( Youth Federation for World Peace ).